Another militant involved in the abduction and murder of Kashmiri army officer Ummer Fayaz was killed by security forces on Sunday in Jammu and Kashmir's Shopain district, police said. Police said the militant, a local, identified as Mohammad Abass Bhatt of Cheki Mantribugh Shopian, was involved in young army officer Lt Ummer Fayaz and in the recent spate of gruesome killings of civilians in Shopian including the decapitating of 19-year young Huzaif Ashraf. Abass Bhatt and his five associates including top commanders of both Hizb and LeT militant outfits were killed by security forces on Sunday in Batagund area of Kapran in district Shopian during a gunfight. Police said that Mohammad Abass Bhatt was convicted for a murder case [FIR No. 82/2011 U/S 302 RPC PS Shopian} and sentenced for 5 years in Jail. “After his release in April 2016, he joined the militant ranks. He was involved in several terror-related crimes and according to police records was involved in the recent spate of gruesome killings of civilians in Shopian including the decapitating of 19-year young Huzaif Ashraf,” Police said in Sunday. Police said that he was wanted by the law for the killing of young officer trainee Lt Omar Fayaz, Advocate Imtiyaz Khan. He was also involved in killing four police personnel at Shopian in August this year and many other civilian killings in the area. Terror cases involing the slain militant include FIR No 32/2017 of PS Shopian u/s 342, 451, 506 RPC 7/25 I.A Act dated 04.03.2017. He along with his other associates had barged inside the residential house of locals, ransacked the household goods and threatened the inmates, FIR No: 46/2017 of PS Shopian u/s 7/27 I.A Act, 307 RPC 3 PPPD Act, 16 ULA dated 23.03.2017. Last year security forces gunned down Lashkar-e-Taiba (LeT) militant Ishfaq Ahmad Padder involved in the abduction and murder of Kashmiri army officer Ummer Fayaz in Kulgam district. The 22-year-old unarmed officer, on leave to visit his home in Kulgam, was kidnapped by militants while attending his cousin's wedding in Batapura village on May 9, 2017. His bullet-riddled body was found the next day in Shopian district. Six militants, an army soldier and a civilian were killed on Sunday during a gunfight between militants and security forces in South Kashmir’s Shopian district. 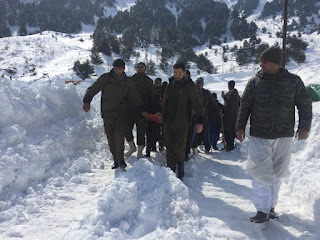 Based on a credible input about the presence of militants in Batagund area of Kapran in district Shopian, a cordon and search operation was launched in the intervening night jointly by Police and security forces in the area, Police spokesman said in a statement. He said that as the searches were going on, the search party was fired upon by the militants. “The fire was retaliated leading to a gunfight. Initially, one jawan of 34 RR sustained injuries in the exchange of fire. He was evacuated to the hospital and is stated to be stable now,” police said. Police said that one Army Jawan identified as Nazir Ahmad of 34 RR who got grievously injured in the final phase of the encounter succumbed to his injuries. “In the ensuing encounter, six militants were neutralized and the bodies were retrieved from the site of encounter. Their identities and affiliations are being ascertained,” he said. As per reports, initially, four militants were killed in the gunfight that broke out at midnight in Batagund-Kapran village. A total of six militants were trapped in a residential house. Of them four were officially declared killed early morning while the rest were alive and engaged forces in firefight. Soon after the two hiding militants were also killed resulting in conclusion of the operation with the killing of six militants. An army spokesperson confirmed the killing of six militants and the soldier. He said arms and ammunition were recovered from the slain. The slain militants are Abbas Bhat resident of Matribug, Mushtaq Ahmad resident of Checki Choland, Khalid Farooq resident of Shopian, Waseem Wagay resident of Amshipora and Umar Majid of Shurut Kulgam. Abbas replaced former Hizb Shopian chief Zeenat-ul-Islam, who returned back to Al-Badr militant outfit recently. Pertinently, a picture of Umar Majid Ganie has gone viral on social media earlier this week which has reportedly taken by him near Ghanta Ghar, Lal Chowk, Srinagar. However, police said that they are verifying the facts and said that the picture could be morphed or taken long back before going viral on social media. “Incriminating materials including a huge quantity of arms and ammunition were recovered from the site of encounter. Police has registered a case and initiated investigation in the matter,” spokesman said. Police said that few individuals sustained injuries at the encounter site and have been evacuated to hospital for medical attention. According to reports, civilian identified as Nouman Ashraf Bhat resident of Bolsu Kulgam suffered bullets injuries during the clashes that broke out between security forces and youth after the gunfight in the area. He was declared brought dead to district hospital Kulgam, they said. Today’s gunfight is fourth encounter in south Kashmir from last Sunday. Since then 12 militants including top commanders of Hizbul Mujahideen and Lashkar-e-Toiba were killed in the last seven days. Of them six each were killed in Anantnag and Shopian, respectively. Army had claimed Satkipora-Bijbehara operation, in which forces killed six militants, a surgical operation. Video showing militants killing Pulwama teenager goes viral.